If you are a regular reader of my blog, you will know that I am a big fan of the dropshipping business model. It is one of the easiest and least expensive ways to start an online business. One of the big problems people have when they think about starting a dropshipping business is finding reliable suppliers. This is where AliExpress comes in, AliExpress is a massive online retailer that lists thousands of products at wholesale prices from many different suppliers. In this guide, you will learn how to start a dropshipping business with AliExpress using a well-known dropshipping automation software. Since you are reading this article, I assume you know a little about what dropshipping is, how it works and how profitable it can be as an online business. 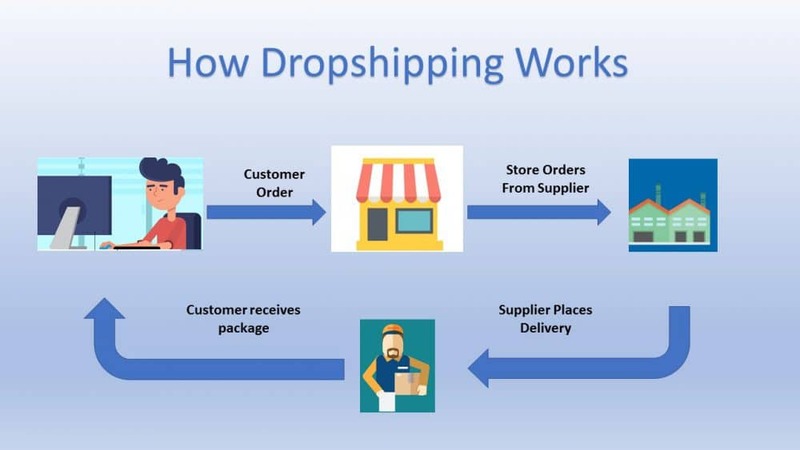 For those who are still unsure about what dropshipping is and how it works, I will give you a brief explanation. Dropshipping is simply re-selling other company’s products without you having to stock any inventory or make delivery arrangements. 4. The supplier delivers the item to your customer. 5. You keep the difference between what you paid your supplier and what your customer paid you. It is becoming an increasingly popular way for people to start an eCommerce business mainly because it requires little investment to get going. Starting a traditional eCommerce business may set you back a few grand, with dropshipping you can get started with less than $100. Another aspect of dropshipping that is very attractive is the fact that you literally just need a laptop and good internet connection to run a dropshipping business from anywhere in the world. To make money online and live the laptop lifestyle is the dream many pursue and with dropshipping it is certainly possible. One of the biggest issues dropshippers have is finding reliable suppliers, it is a well-known fact that the majority of good suppliers and wholesalers do not have websites that you can discover through a simple search on Google. However, on AliExpress, you have direct access to hundreds of suppliers and thousands of products at wholesale prices. Dropshipping with AliExpress is proving very popular among eCommerce entrepreneurs and one reason is that you can assess the quality of a supplier by analysing the feedback and rating other people have left them. This feedback will be crucial when you start looking for suppliers to partner with. Of course, the other reason AliExpress is very popular with dropshippers is that of their wide range of quality products at extremely low prices. The low prices mean you can substantially increase the prices for a pretty big profit margin. It is no secret that many AliExpress dropshippers have built very successful eCommerce business’s and are making life changing income with their dropshipping business. These are just a couple of the many success stories that people have had dropshipping through AliExpress with the AliDropship plugin. One reason for their success is finding good products to sell and reliable suppliers to partner with. It also helps to have an automation software like AliDropship (more on that later). Although there are many good products, you must be careful to avoid the bad quality ones, this is why it’s important that you check the feedback for both your potential supplier and the product you want to dropship. The excellent rating system that AliExpress has in place means that it is pretty easy to spot good and bad suppliers. First, go to the supplier store on AliExpress and then click on the feedback tab. For example, below is the feedback page of the store SHENHONG Kitchenware store. You will see three rating box’s for the seller and at the bottom, there is also a live feed of reviews from the most recent customers near the bottom of the page. The top box gives an overall rating for the seller and it mentions how long they have been in operation. After extensive research, I have to the conclusion that you should make sure the seller has an overall rating above 90% and has been selling on AliExpress for at least a couple of years. Item as described – The sellers are rated for how well the item description is to the product that is delivered. The ratings are given a score out of 5 and you should make sure that they are all above 4, preferably 4.5. The third box provides a total number of positive, neutral and negative feedback a seller has received within the last 1, 3 and 6 months. This is a live feed of the ratings a customer has given a product that they have purchased from the supplier. It will reflect the overall rating of the supplier, so for instance, if the supplier has a positive rating, most of the feedback will be 4-5 stars. After you have validated the reliability of the supplier, you should also check out the feedback for the product you want to dropship. Make sure the product has been ordered at least 200 times and has a positive rating over 4. For example, staying with the same supplier, I noticed this Pineapple Slicer, that met all the conditions for being a potential product that I could dropship. I have already mentioned some of the benefits of dropshipping with AliEpress, however, there are a couple more I would like to touch upon. The first one is that all of the suppliers on AliExpress are aware that most of their customers are resellers as well. This means you can and should ask them not to put any promotional material inside any package that is being delivered. The other reason is that you can use all the images, description and even reviews of the product you want to sell in your own store. This is great as it means you will not have to worry about taking high-quality images or writing your product descriptions (although it is advised to at least re-write it for SEO purposes). As easy as it is to start dropshipping with AliExpress, a lot of the tasks are time-consuming and can get tedious. Imagine having to import 50 products into your store (which is a low amount) and having to manually import the images and descriptions manually. It would take forever!! Not only that but you would also have to keep an eye on the inventory levels and look out for any price changes. Keeping on top of all these tasks is doable but not very practical and it would make it harder for you to succeed in dropshipping. Luckily, there is a solution, automation software!! As AliExpress dropshipping is hugely popular it has led to the developments of many automation apps. Many of them I have reviewed on this site. Oberlo – Oberlo is a Shopify app which means it only works on the Shopify platform. AliDropship – AliDropship is a WordPress plugin that is only compatible with eCommerce stores built on WordPress. Both Oberlo and AliDropship have very similar features, the only thing for you to decide is which platform you want to build your eCommerce business on. Although I do like them both, I actually prefer AliDropship because it is a WordPress plugin and I am familiar with the platform. AliDropship has some fantastic automation features that will help you run your dropshipping store more efficiently. Automatic inventory and price updates – As the plugin is connected via API, you will get up to date inventory stats and pricing changes. Plus many other features, now this articles isn’t a review about AliDropship but if you would like more information about this awesome plugin, you can read my review here. This is one of the most important parts of starting any eCommerce business. It will require a lot of research but it will be worth it in the end. Many people fail in eCommerce because they rush this part and think just filling their site with generic products will do. There are many ways that you can identify a profitable product to sell online. If you have trouble finding a good product to sell, these following articles should give you some good insights into the kind of products that do well with dropshippers. Gone are the days when you needed to know some web programming languages to build a website. With platforms like WordPress, it is quite easy to set up a site within a few hours. First, you will need to purchase a domain name for your website, this should be a name that is relevant to the products you will be selling. There are plenty of domain name registrars, I personally purchase Namecheap as they provide 1 year free of WHOIS protection plus they are cheaper than most other domain name registrars. For web hosting, you have plenty of options as most good web hosting companies have 1 click WordPress installation. I like Blue Host, they are a good choice and their starting prices are cheap. After you have signed up and installed WordPress, you will need to install WooCommerce. This is a very simple process as the video below shows. If you are not comfortable with building a website, AliDropship have a service that will build you a custom-made store. They provide everything from niche research to optimising your site for maximum conversions. Prices start at $299, click on the button below for more information. Now, we come to the exciting part, importing products from AliExpress into your store. Without an automation software like AliDropship plugin, this part would have taken ages to complete. Luckily, AliDropship makes it so easy that anyone can start a dropshipping business by sourcing products from AliExpress and selling them in your store. After you have purchased AliDropship and installed it (dont worry, AliDropship provide fantastic resources that guide you how to do this) and downloaded the AliDropship Chrome extension, you will be ready to import products with the click of a button. So, you have identified a product to sell and need to find a good supplier on AliExpress who will dropship, preferably with ePacket shipping. ePacket is one of the cheapest and fastest shipping methods and is the preferred shipping method for small lightweight items. Finding products that have ePacket shipping option would have been another long process but with AliDropship you will save a considerable amount of time. Head on over to AliExpress, if you have installed the Chrome extension, you should see the AliDropship chrome extension on the top of the browser. If you click on the gear wheels, it will give you a few options like shipping destination, shipping method (ePacket) and a few other options. You can import multiple products at the time same time or you can import them one by one., I usually do it one by one. You can import all the images and product description as well as any information about product variances like size and colour. The Chrome extension also allows you to edit the product description, assign any pricing rules and the product images. One other helpful feature that the Chrome extension has it that it gives an overall score for the supplier. So as well as checking for the reliability of a supplier yourself, you get a free second opinion from the plugin and usually, it concurs with the overall AliExpress rating. Although everything is imported with the click of a button, it is best practice to change the description as you want your store to be unique and also for SEO purposes as Google does not like duplicate content. Also, a lot of the sellers on AliExpress do not put much thought into writing product description that sells, their prices are already cheap and AliExpress gets hundreds of million visitors a month, they have no need to write excellent copy, the items sell themselves. However, as a new dropshipper, you do not have a platform like AliExpress with huge amounts of traffic nor do you have brand recognition, that is why it is good to rewrite the description so it compels your customers to buy. The plugin also has a built-in image editor that will allow you to edit images and remove any watermarks. You can easily set pricing rules for all your products through the AliDropship pricing automation feature. How much you mark up your prices by will depend on the type of products you are selling. First, you will want to see what prices similar products are selling for on places like Amazon and eBay. To set your prices you have a few options, you can create a pricing formula for yourself and use it for all the products or only certain categories. You also have the choice of implementing AliDropships own pricing mark up formula.